Conferences let you share live video, discussion, presentations, files, and more with your students in real-time. Populi integrates with BigBlueButton (BBB), a service that enables these features for use in your courses. This article describes how a Populi account administrator can set it up and how faculty can set up conferences in their courses. Set up your own hosting situation. While this might be a lower out-of-pocket cost, it's also a lot of work. Engage someone to host it for you. You probably have a few options, but Blindside Networks runs BBB and provides hosting and support services for a lot of schools and other organizations. Scroll down the page and enter the BigBlueButton API Endpoint and Shared Secret settings. You can get these from your BigBlueButton host. Scroll back to the top of the page and click Save Settings. Recordings made using the test account will expire after 7 days. Certain features (like breakout rooms) are disabled. The following welcome message will appear in the public chat for all BigBlueButton sessions: For help using BigBlueButton watch these short tutorial videos. This BigBlueButton session is provided free of charge by Blindside Networks Inc. to Populi customers. Recordings are automatically deleted after 7 days. For permanent recordings and other premium features, please contact Blindside Networks. The Conferences view shows you all the conferences you've set up for that course. In Progress conferences are currently open; course faculty and students who've been included can join the conference. Scheduled conferences have yet to begin; course faculty can start them at any time. Concluded conferences have already ended; they may include a link to view a recording of the conference. Enter a name and an optional description. Enter an optional start time and time limit. The start time is strictly for information purposes—conferences will not start until you manually start it. Select the students you wish to invite to this conference. By default, all the students in your course will be able to join it; you can also select individual students. Now that you've created the conference, it will list under Scheduled Conferences. Students who are permitted to join it will see the conference when they view the course Conferences view. It will also appear on the course calendar and will show on upcoming events on the course dashboard view. When it's time to start the conference, click Start Conference next to the Scheduled conference you wish to begin. BigBlueButton will open in a new browswer window or tab. For details about how to participate in a conference, please have a look at the BigBlueButton tutorial videos. When it's time to conclude the conference, go to the course Conferences view in Populi and click End Conference. 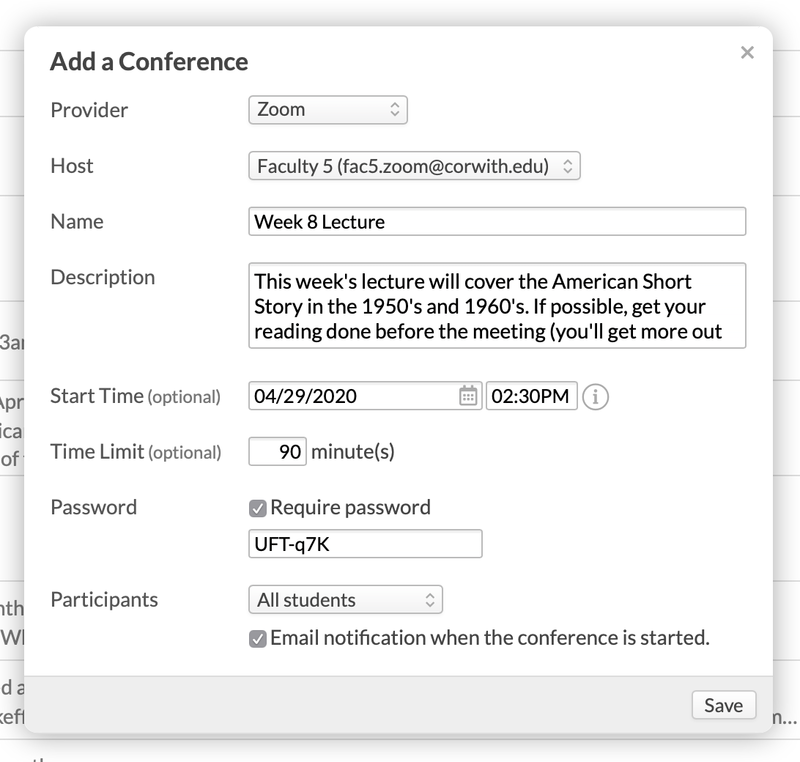 When you do this, all the users in the conference at that time will be logged out of BigBlueButton. The conference will display under Concluded. If you recorded any parts of the conference, a link to view the recordings will appear after a few minutes. We've spent some time testing out the BBB web conferencing integration and it works very well. It will be well worth the investment. With online education continuing to grow, this opens up important ways to develop better relationships with online students. Thanks so much to Populi for making this possible.